If you were to follow her around on any given day, remember one thing; be prepared to keep up. “Some days can be pretty laid back, and that makes it easy to catch up on paperwork at the office, but that’s the exception, not the…hold on; I need to grab this.” This is the first of many phone calls and office intercom pages for Anita Tate during our conversation. 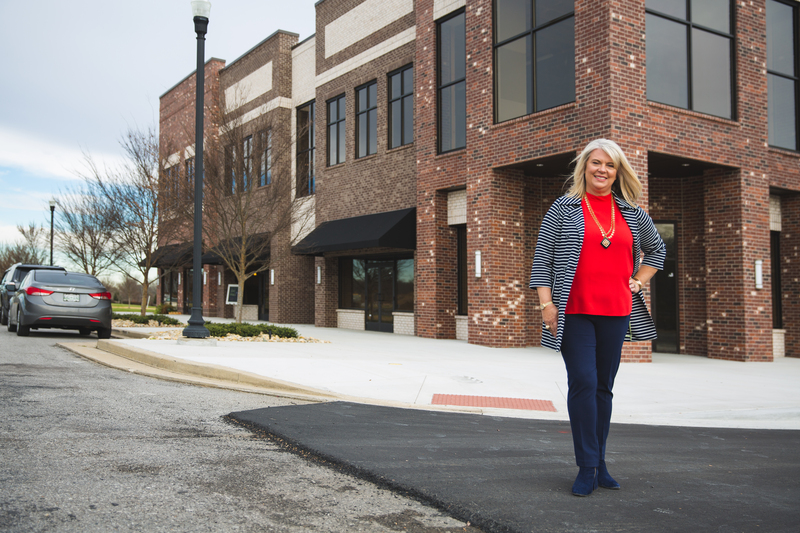 Anita is the owner and Principal Broker at Century 21 West Main Realty & Auction in Lebanon. She’s busy, but on an overcast winter afternoon, the exception happened, so she was able to sit down and share her story. 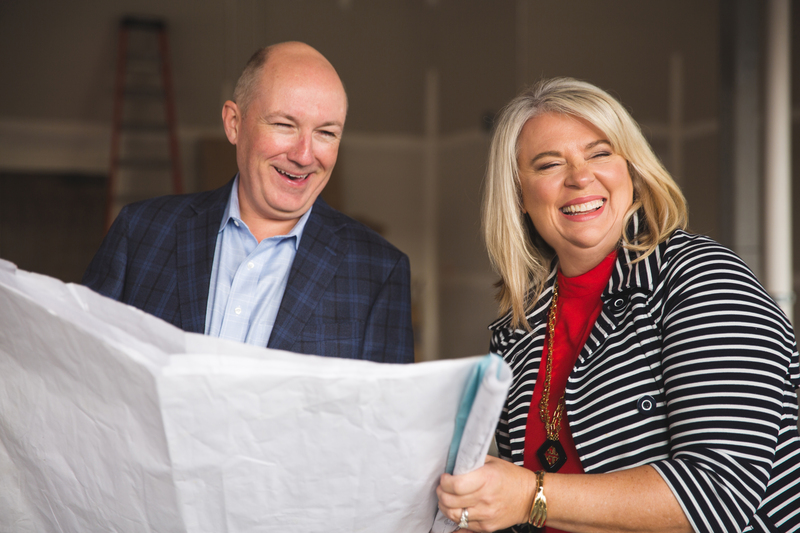 ABOVE: Anita cuts up with Rick Bell as they survey progress inside a space at the new Hamilton Springs mixed-use development. Rick and his brother Jack Bell are the developers while Anita is the listing agent on the project. The road from her childhood in Madison, Tennessee has been filled with twists and turns. “My father died when I was 14 years-old, so my mother was left to raise me and my sisters by herself.” Anita continues, “We had to do our part around the house. Nothing was just given to us, and I’m so thankful for that. I think it’s rare these days that parents expect kids to do their share in a household.” It was her experience growing up the youngest of five girls, that she became accustomed to a busy environment. So, when her only child, Lesli left for college, and the hum of teenage activity fell silent, she found herself searching for something to fill that space. “You could say my real estate career started out of boredom, something to keep me busy while I adapted to becoming an empty nester. long after they started a family of their own. 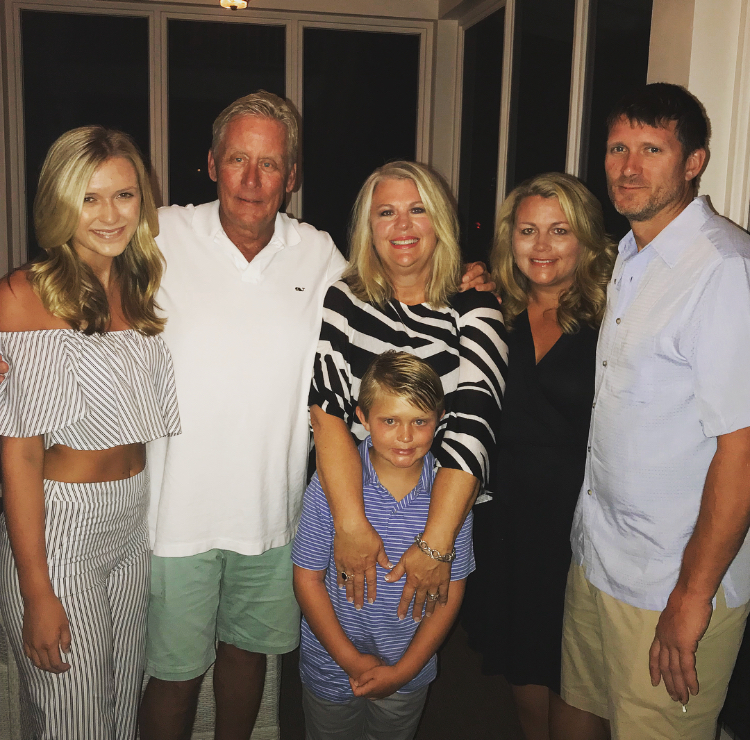 Below: Anita and her husband John pose with their grandaughter Talor, grandson Jake, Lesli and Lesli’s husband Trent. 1. She’s been married to Dr. John Tate for 15 years. 2. She has two grandchildren; Talor, 17 and Jake, 8. 3. She obtained her realtor license in 1995. 4. She opened her own brokerage in 2005. 5. 2014 Realtor of the Year, Eastern Middle Tennessee Association of Realtors. 7. Professional designations- GRI, SRES, ABR, and CBR and is a State of Tennessee licensed auctioneer. * Wings over Wilson is a faith-based women’s charity group that helps support needs inside Wilson County.